Ermid t’Augrondir had fallen far from fortune’s favor. 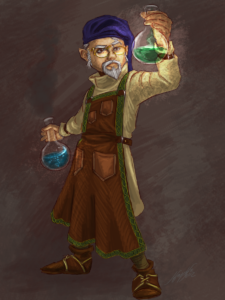 Once a professor of astronomical alchemy at the foremost Gnomish University in the fair city of Sargola, Ermid was now a fugitive of a brand of justice bought and sold like so many clams at the summer market. He had been forced to leave everything behind: his many fine books, his magical lyre, even his twin sister Enid whose love and music were like the radiance of Kupriel on warm summer evening. Despite the many rumors to the contrary, Ermid wasn’t able to control other people. His noble detractors liked to claim that their daughters were lured to perdition by the vibrations of his seven strings and the silky grace of his voice, but they were all a bunch of stinking liars. The fact is, these nobly born daughters, newly admitted in the last year to a University that had previously only accepted boys, had thrown themselves at Ermid with the inexorable force of flowers in the full bloom of springtime. Who was he to resist the powers of nature? How did these nobles have any right to complain of their daughters’ misplaced virtue, when for centuries their sons had been kidnapped at the docks by unscrupulous professors in need of students? It had never been a secret that at Sargola, a higher education was rife with perils both pecuniary and moral. And yet despite all this, the many glorious nights spent under the stars with his ephemeral favorites had somehow accumulated a critical mass malignantly leveraged by his detractors to tip the scales of justice against him. The many noble fathers, realizing that their individual complaints held little force, had banded together in a conspiracy to grease the gears of the law, inventing crimes where none truly existed. His twin sister Enid, a masterful musician in her own right, was the only one who understood him. Enid could play circles around Ermid on every organ of musicianship save the lyre, but all agreed she couldn’t match the warmth and seductiveness of his voice. For all the trouble that Ermid’s vocal and other organs would get them into, Enid was always able to talk their way out of it. There had also been the t’Augrondir estate to sustain them, but when their father had passed in the winter, trouble began to brew like the putrefaction at the bottom of a neglected experiment in Ermid’s lab. Enid, spotting difficulties on the horizon, had urged her brother to amend his concupiscent ways, but Ermid’s organ of sense remained incorrigibly wedged in vices he seemed unable to recognize as such. Only at the proverbial last minute, with the dogs of miscarried justice nipping at his heels, had Ermid fled Sargola, leaving everything of value behind. When he arrived at Vendigar, he checked in with the courier post, where Enid had said she would send the funds necessary to sustain him. Instead he found a letter from his sister detailing how the criminal and civil cases against him had detained all the t’Augrondir estate’s funds in a legal quagmire. Alas, he was truly on his own now. Why hadn’t he foreseen any of this misfortune in the movements of mighty Phaethiel? He had become like some great Sargolan merchant vessel, adrift on the trackless sea without the stars to guide his course. Yet despite everything, Ermid felt hopeful. This unsuspected blackening of his fortune, what else could it be but the melanosis that signaled the onset of the Great Work, the Summum Bonum, true wisdom and perfect happiness?